I mean, who wants to look at pictures of skinned baby seals? I had a moment of eerie and upsetting disjunction this morning while listening to the CBC (that is, Canadian Broadcasting Co) radio news. The announcer says that humanitarian aid organizations believe that 29,000 children under the age of 5 have died in past 90 days as a result of the famine now afflicting southern Somalia. He goes on to say that nearly half a million young children are expected to die during this latest Somalian disaster. Then, his voice shifting to an almost chirpy tone, he says, “Sports is next, after this break.” And an ad for furniture begins blaring, and I change the channel. 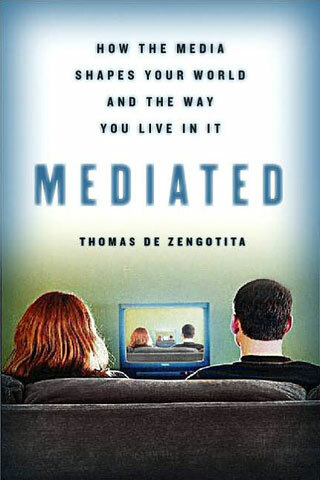 The most upsetting thing about this is that I might not even have noticed it had I not stayed up past my bedtime last night reading Thomas de Zengotita’s fascinating new book Mediated: How the Media Shapes Your World and the Way You Live in It. De Zengotita (yes, that is his real name, apparently), argues that because of the way we are all supersaturated by the media now, we are forced to adapt by mentally “surfing” what we take in, on a generally unconscious level. “The moreness of everything ascends inevitably to a threshold in psychic life. A change of state takes place…[as] the mind is forced to certain adaptations, if it is to cohere at all. So, for example, when you hear statistics about AIDS in Africa for the 349th time, or see your 927th picture of a weeping fireman or an oil-drenched seabird, you can’t help but become fundamentally indifferent–unless it happens to be “your issue,” of course, one you “identify with,” a social responsibility option you have chosen. Otherwise, you glide on, you have to, because you are exposed to things like this all the time. All the time. Over breakfast. In the waiting room. Driving to work. At the checkout counter. All the time” (24). De Zengotita says that as a result, we are cocooned inside what he calls a “Blob,” or others might call a bubble, which “mediates” between us and the outside world. “Once in a while, in the public realm, some eruption of fate or evil–9/11, obviously, but also, say, a school shooting, the abuse at Abu Ghraib, the hostage beheadings, something like that–will feel as if it…might pierce the membrane and…at least interrupt the Blob’s progress through the universe. “But no. Watch as the media antibodies swarm to the scene of those nascent interruptions. These are the junctures that require the most coverage–and the latent meaning, the ironic dialectic implicit in that word emerges. What must be covered is any event or person or deed that might challenge the Blob with something like a limit, something the Blob cannot absorb, something that could, in resistance or escape, become the one thing the omni-tolerant Blob cannot allow, something outside it, something unmediated–something real. “But not to worry. The Blob may have to devote some extra time and energy to these challenges, but in the end it prevails. And how is the moment of its victory marked? By your indifference….That’s when the original being of the real thing has been fully mediated. It becomes representational, and that means optional. You can turn it off, or on. It’s up to you again (27). I have of course noticed this indifference in myself and others–this ability to ignore anything disturbing that we learn of through the media. I knew it was related to being overly saturated with bad news, to the point where our ability to empathize becomes numbed and disabled. But I hadn’t really considered the extent to which this mediation process is alienating and impairing our fundamental ability to connect to the real. We are so used to seeing emotion and action happening onscreen that even when it is happening to us directly, de Zengotita says, we “perform” as if we are acting in our own personal movie. And it becomes harder and harder for us to “turn off” this performative state. De Zengotita gives several caveats about how the mediated public he’s talking about are the wealthy First World types like you and me, the ones who spend half their waking hours online, and are more at home with a keyboard than any other tool. We do not represent the majority of humans yet, by any means, though our ranks grow every day. Because we are so globally connected via the media, we know about the thousands of Haitians still living without permanent shelter 19 months after the big hurricane hit, and now going into yet another hurricane season. 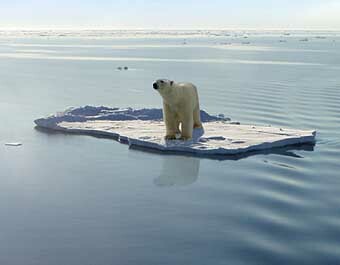 We know about the famine in Somalia, and the polar bears swimming to death as the Arctic ice melts. That’s part of the eeriness of this–we know about them, but they don’t know about us. We have an almost godlike power to look down on the globe, Google-Earth-style, and watch what is going on everywhere. And then we have the power to click another link and move on. Hence the huge challenge for activist movements today to arouse the masses to action–especially, it seems, young people. We saw what happened in the so-called “Arab Spring” when the youth there texted their way to revolution. But here in the US, our kids seem to be too busy enjoying life, playing video games and going to the mall, to worry about difficult issues like climate change or economic meltdown. De Zengotita observes how activist organizations spend millions of dollars to create “hard-hitting films” that will break through the Blob/bubble and galvanize people to political action. “Kids today have been subjected to thousands and thousands of high-impact images of misery and injustice in every corner of the globe before their are old enough to drive,” he says. “The producers of these images compete with each other to arouse as much horror and pity and outrage as possible, hoping that this encounter with a person dying of AIDS or that documentary about sweatshop labor or these photographs of recently skinned baby seals will mobilize commitment. “But what the cumulative experience has actually mobilized, in the majority, is that characteristic ironic distance that aging activists mistook for apathy. But it wasn’t apathy as much as it was psychological numbness, a general defense against representational intrusions of all kinds–especially painful ones. I mean, who wants to look at pictures of skinned baby seals?” (135). True that. And perhaps we mediated folk are doing the only healthy thing we can do faced with such a barrage of psychically inflicted pain–tuning out. But there seems to me to be something profoundly immoral about all of us sitting pretty in front of our screens here in the heart of Empire, knowing about and ignoring the suffering that our lifestyles have done so much to cause. So the question becomes: how to do battle with that Blob? Did someone say young people are apathetic? Thanks for the article, Tory, I hadn’t read it although I remember when that was going on in 1992. And now here we are again…a very dark sort of Groundhog Day indeed….